Kevin Plank called President Trump “a real asset for the country” in an interview on Tuesday. 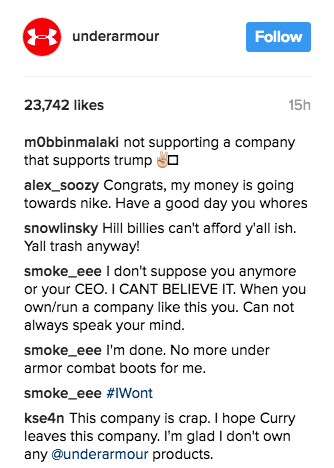 Sportswear company Under Armour is facing social media backlash and threats of boycott after CEO Kevin Plank spoke out in favor of President Donald Trump's pro-business leadership style on Tuesday evening. Plank met with Trump in the White House on Jan. 23 along with other business leaders including Tesla CEO Elon Musk and executives from Dow Chemical, Dell, and GE to talk about manufacturing and job creation in the US. When asked about Plank's comments, Golden State Warriors star Stephen Curry, who has a contract with Under Armour, told Mercury News he agreed with the "asset" description, “if you remove the ‘et’” from asset. Curry said Plank later clarified to him that his comments were purely from a business perspective, but that he would cut ties with the company if "the leadership is not in line with my core values." Twitter was also ablaze with people announcing that they would no longer buy Under Armour apparel or shoes following the endorsement. Time to show @UnderArmour'S CEO what having a "Pro Business President" like this one does to your business. Me to my son: "Welp, @UnderArmour supports Trump." My 9yo: "Yup, not wearing that anymore." @UnderArmour - you can say "hasta nunca" to my money. You just lost thousands a year from me. My four children deserve better. 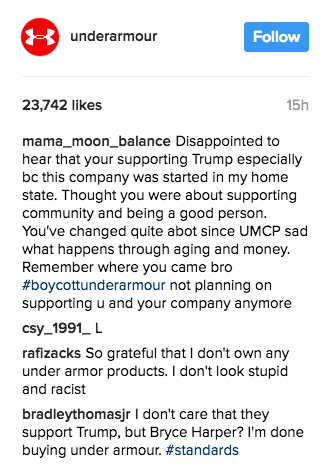 People also took to Under Armour’s Instagram account to post similar comments. But others showed their support of Plank, and said they would continue to buy Under Armour. Time to go buy even more @UnderArmour for my son. Thank you Mr. Plank for standing up for @realDonaldTrump. Working America supports you! With its headquarters in Baltimore, Under Armour also faced heavy criticism from a local politician there. “When Kevin Plank aligns himself with Donald Trump’s administration by serving as an advisor to it, he is normalizing Trump’s behavior and treating his administration as legitimate,” Baltimore City Councilman Ryan Dorsey wrote in a statement on his website. “He is also earning a significant amount of potential political capital with these actions,” he added.